and situations where they meet unpredictable language. Also, New Headway Pre-Intermediate is good preperation for the PET exam. 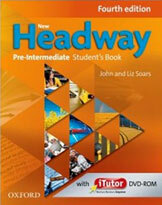 the New Headway Pre-Intermediate workbook, and also the New Headway Pre-Intermediate class audio. and the New Headway Pre-Intermediate workbook. and when you complete our course you will feel confident in teaching even advanced students. audio when teaching English over Skype.